Skills Funding Agency funding and programmes director Keith Smith (pictured above) has warned college leaders they were facing a “huge challenge” when the apprenticeship levy allows subcontractors to receive funding directly from the government. 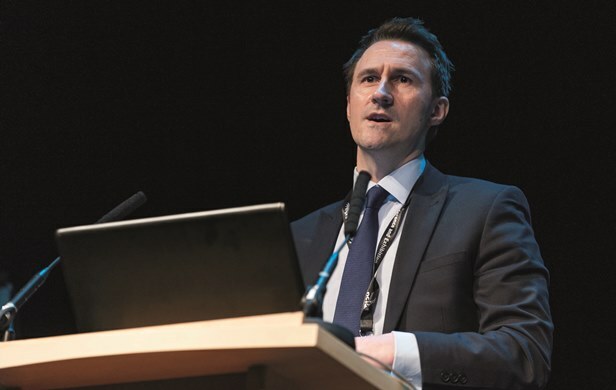 He said the changes could have a serious impact on college funding, during an update he gave in a breakout session at the Association of Colleges annual conference, in Birmingham on Wednesday (November 18). “Colleges are spending at the moment just under 20 pence in the pound on apprenticeships,” he said. “However, in the adult world … over 40 per cent of that you are subcontracting out. “So if you convert that into how much money is going directly to you, in worse cases it is an average of less than 10 pence in the pound. The government’s large employers’ apprenticeship levy reform changes set to come into action in April 2017 will mean that colleges no longer have a funding allocation for apprenticeships. Instead, employers will be able to approach subcontractors to work directly with them, potentially leaving colleges in the cold. Mr Smith said he proposed a “two-fold” challenge to colleges — firstly to do more apprenticeships and secondly to rethink their delivery models and structures for securing business. Mr Smith said colleges should not waste time in addressing the challenges the apprenticeship levy would bring. How will this new scheme be audited? How can you have tiny providers getting what amounts to direct funding? This could make the Individual Learning Accounts farrago look like a picnic. Any scheme like this needs incredibly close monitoring or there *will* be massive fraud. I’m sorry, but this just doesn’t make sense. There needs to be an audit regime as this is public money, so who will deal with the millions of small private training providers that don’t have the capacity to produce ILRs or deal with Ofsted. I don’t believe this is the end for sub contracting per se, but clearly it will be for the larger private training providers. The devil is in the detail, but in my opinion, Colleges do an excellent job of keeping these companies in line. Without this type of control, we will have many more major headlines about unscrupulous private training providers. Like previous commentators I wonder how the government will ensure there is no misappropriation of public funds (AKA fraud) and also how they will ensure at least good quality. We can all envisage ILA-type embarrassing and fraudulent fiascos and a return to primes and subcontractors a few years down the line. I was under the impression that this was a QUESTION in the consultation and that consequently was under review. Has this been firmly decided upon now as a definite government policy? …..Wake up everyone – this is a Conservative government that is working for the benefit of the few at the expense of the many. Why then are the government asking colleges to pay for an independent audit to show that they have the correct subcontracting management controls in place? I seems ridiculous to be forcing more spending on already cash strapped colleges. This new ‘simplified’ system seems to be incredibly complicated and raising more questions than it is answering. I’d still like to understand the controls on this, how will the government ensure learners are getting the right offer and service. How will subcontractors be selected and how will government sense check the levels and scope of service, Lots of questions …. The goal in this is a system that engages large employers in funding their own and a growth in Apprenticeships and as the article suggests for that to happen the employer must be in control. In chasing the goal of large employer engagement in the levy/funding scenario is it a case of hitting that target but loosing a lot of other aspect aspects available from a more robust and universal approach. Clearly the casualty in these arrangements might well be much of the education and training infrastructure. Also many surveys have shown that most large employers do not engage those at the margin, where as SMEs tend to be more approachable to the less well fitted Apprenticeship candidates. Desperate measures to come nearer to the unrealistic apprenticeship target, with no interest in quality assurance or supporting SMEs. Disgraceful. This is only a concern from an administration perspective if the organisations in question don’t have the tools to manage the situation they may be presented with. Traditional solutions to SFA fund management are time consuming, expensive and often require a major investment of time and money hence why this could be deemed a problem. What is needed is a robust scalable software platform to enable SME’s and educational institutions to deal with this problem. There are software products out there that try to resolve this issue but I’m afraid most of them are not up to the the challenge. Eligibility and other surrounding factors cause major problems for FE colleges and they have good experience with SFA and they still struggle. There is hope though. Over 30 colleges use the new online platform to resolve this simply and effectively and with a very low overhead. Fund management can be simple but it must be done the right way and in a transparent manner. Reading comments that are clearly those of people who work within Colleges really infuriates me. They seem to be of the opinion that all small providers are not capable of managing their own funding arrangements without them! I have worked in FE for many years, with experience of direct and sub contract partnerships, and know there are rotten apples in both small providers, and Colleges. Simply pigeonholing small providers in this way is disrespectful and arrogant. Many Colleges deliver as though they are sausage making, and are inflexible, when compared to small providers. The best providers I have seen as an EV are without exception, those that currently fall into the SME category. the biggest issue they have is the time it takes to complete ridiculous amounts of paperwork imposed on them by Colleges, and in many cases being forced down the route of e-portfolios at great expense to them, just so the Colleges can keep a closer eye on them whilst reducing their own costs. I know, it is simply a case of “do what I say, not what I do” rules imposed by people who are ignorant of the challenges faced by small providers, whilst creaming a nice percentage off the top.